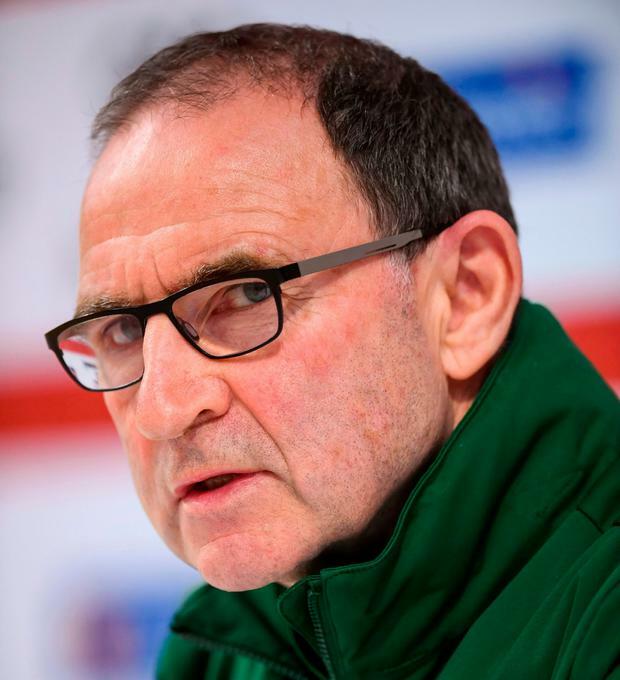 Martin O’Neill says he will consider a role for uncapped striker Michael Obafemi in tonight’s Nations League test away to Denmark. But the Irish boss has again defended his stance over not capping Declan Rice in the World Cup qualifiers last year and said it would be “lunacy” to have his team selection dictated by a need to get dual-eligibility players tied down. A potential tug-of-war with Nigeria or England for the services of the Dublin-born Obafemi looked likely last week as O’Neill suggested that the player would be reluctant to travel to Denmark as he had yet to make a final call on his international allegiance. That was defused when Obafemi’s agent issues a statement on Thursday, insisting that the teenager was fully committed to Ireland. Obafemi was the only one of the four strikers in the squad not to get a run-out in last week’s 0-0 draw with Northern Ireland but he could get a debut in Aarhus tonight. “I think he has definitely committed himself to us now with the discussions that we’ve had. He wants to play. I will have a look at it and see how we are just before the game,” said O’Neill. He insists that he’s at fault for the Declan Rice saga, again denying the claim that Rice could have been tied down to Ireland if only O’Neill had used him in the World Cup qualifier at home to Moldova last year, just after the teenager had broken into the West Ham side. “I find incredible that I should be thinking about that during a game where we are fighting for lives and trying to win at home,” the manager said. “To think about putting him on for a couple of minutes just to cap him is crazy, crazy thinking that you should have your mindset on that. “Secondly, and probably just as important, the player would know. So I would say if Declan had thoughts about who he was going to play for, I think that would have reared its head at that particular time. “So to have that criticism directed at you is lunacy, real lunacy. “There are certain things I’m responsible for, but someone making their mind up, the word entrapment was used, that’s not in my headspace, far from it. I think that whole situation is absolutely ludicrous. “Obafemi is in exactly the same position. If he has committed himself to us, as he has done, perhaps we will think about playing him. It’s been his choice and his family’s choice, and that is totally different to Declan,” O’Neill added. Having watched the rugby team’s win over New Zealand on Saturday, O’Neill is keen for his team to show up in Aarhus. “I want us to play well, it’s my responsibility to get them to play,” he said.